I want to apologize for running this article for two weeks. I have been traveling and didn't get a new one ready in time. I will publish a new article Sunday, August 2. The following article was published on www.strokewise.info hosted by David Valiulis. David has allowed me to re-publish some of his articles on our blog. Thank you David! Please visit his site when you get the chance. David has attended our Rockford, Illinois camp in previous years, and this year I might have the opportunity to meet him since I will be there helping with camp duties. The apps mentioned here are for iPads but as David mentioned there are many Android apps on the Google Play store as well as the Android App store. Android tablets exist that are much cheaper than iPads yet just as powerfull for these apps. As a precaution, if you don't use the above mentioned internet stores or the sites mentioned in this article, be certain you trust who you are downloading from. I have not verified any of these sites personally so I am assuming that the sites mentioned in this article are legitimate sites that David trusts. I would recommend a stroke survivor getting a dedicated tablet used only for these types of apps and not for storing personal information. People who have had strokes and aphasia might be candidates for using small computers (primarily tablets) for communication or to relearn how to speak. 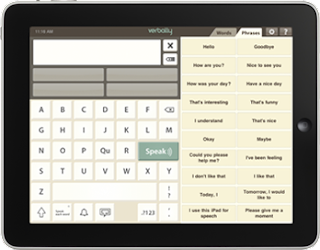 These tablets are great for complex communication because they have a speech generating device, text to speech, virtual keyboards, pictures, symbols, and video; plus you can download Skype to make phone calls. Dedicated machines also exist from many vendors, such as the Windows-based system from DynaVox or the Mac-based Lingraphica system, both costing much more than the tablet-based solutions. 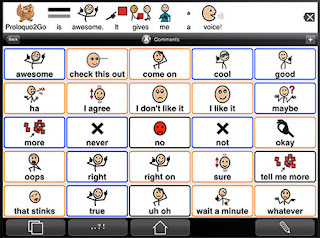 Augmentative and Alternative Communication covers a large range of techniques which support or replace spoken communication. 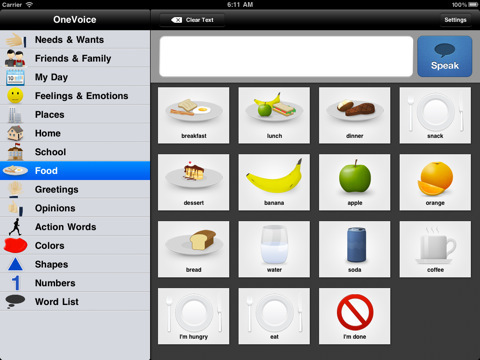 In the following list, AAC means the iPad app speaks for you instead of helping you to improve your speech. 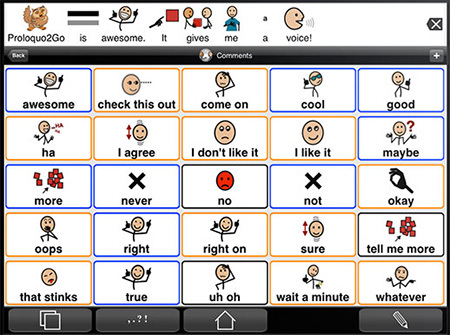 As opposed to AAC apps, therapeutic apps help the patient practice (and thus improve) their speech. You can read my list of apps below. For a more-complete list of apps, see http://tactustherapy.coam/downloads/#8e74e7178ec1f94c8. All the SmallTalk iPhone apps are not editable and icon-based. Aphasia (blue) – a male voice speaks various words and phrases (includes the same words/phrases spoken by a woman’s mouth for practice). It provides natural sounding text-to-speech voices (American, British, and Indian English), high-resolution symbols, automatic conjugations, a default vocabulary of over 7000 items, word prediction, expandability, and accepts your own pictures. Lots of great features and icons, but you can get lost using them. 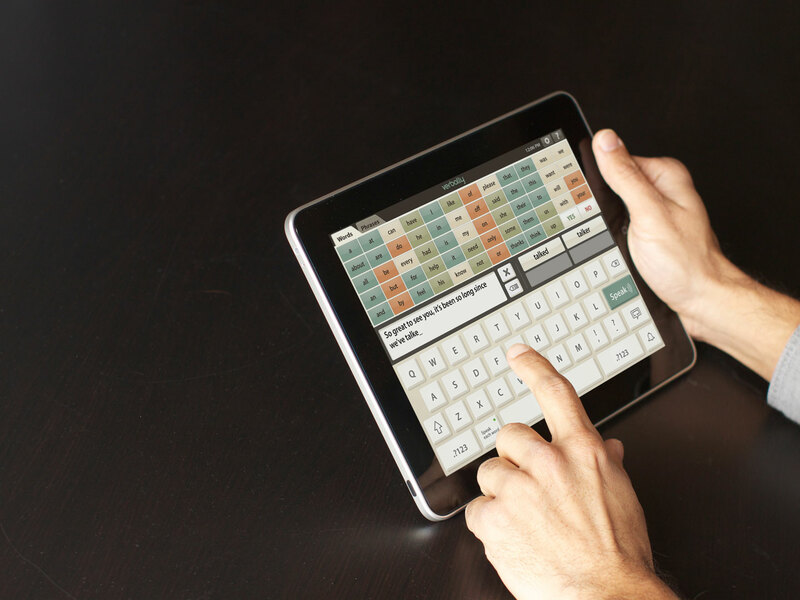 A customizable talking keyboard. 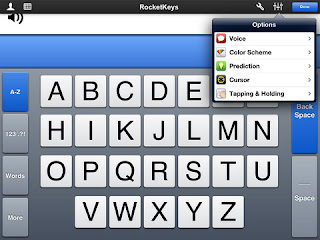 This app lets you build the keyboard by choosing the exact keys, size, layout, colors, prediction, and voices you want. Does less than Proloquo2Go in an attempt to make it easier to use. Comes with a pre-populated icon-based vocabulary (focused on children). An iPhone icon-based app to which you can add words/phrases by choosing one of the over 800 symbols or by taking a picture yourself. Organize these custom words by placing them in a custom color-coded folder. 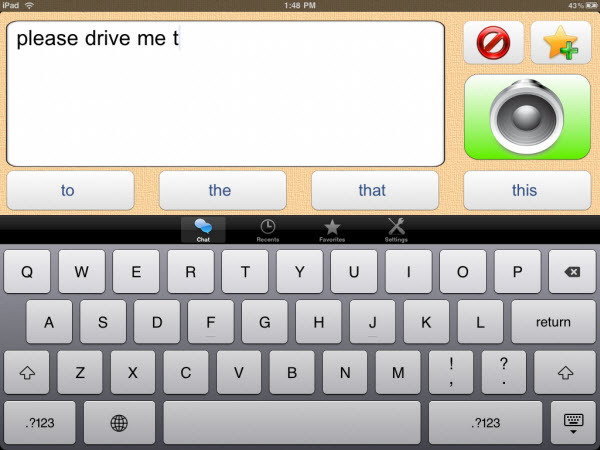 A keyboard-based solution to speak your words. contains 50 essential words to save you typing. offers common phrases to enable faster conversation. 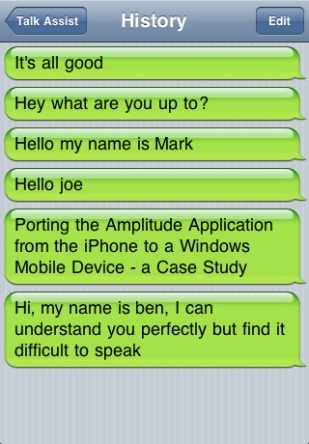 Text prediction - learns the words you use. Choice of 3 keyboard layouts. Choice of male or female computer-generated voice. Turn on “Speak Each Word” to have the app speak as soon as each word is completed or when you tap a phrase. A chime to get someone’s attention. 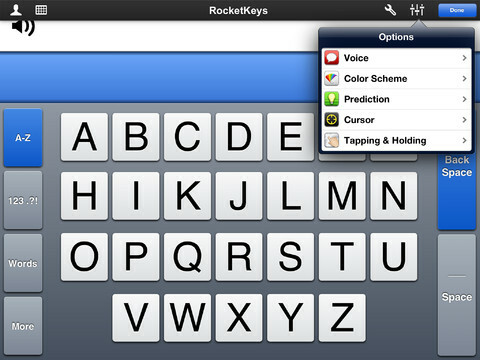 Steady Hands feature makes the app type only when you lift your finger off of the intended letter on the keyboard. No Wi-Fi or 3G connection required. 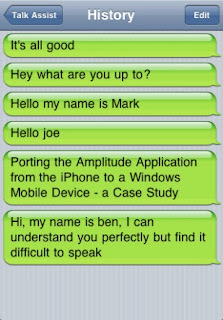 A simple keyboard-based iPhone app where anything you type will be spoken out loud using a computer-generated voice. Phrases are saved to a history, and favorite phrases can be bookmarked for regular use. Constant Therapy is an iPad application with 60+ tasks with up to 10 challenge levels, allowing for personalized activity programs for each individual. Constant Therapy provides tools for stroke survivors who want to improve their speaking, reading, writing, counting money, solving problems, reading maps and calendars, and more. 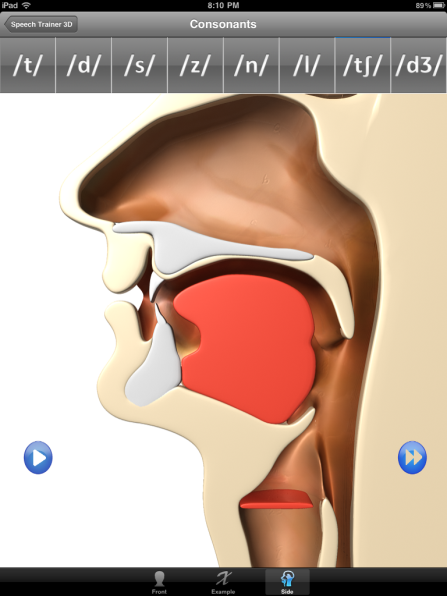 An iPhone app where the patient can follow close-up videos of mouth movements. The combination of visual, auditory, and in some cases, written cues prompts patients to produce speech. 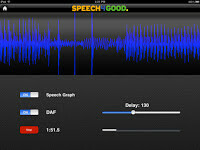 Allows to monitor, record, and share your speech therapy. This is a 3D demonstration of all sounds in the English language. Has detailed 3D animations that demonstrate the correct positioning of the tongue, lips, and mouth. Has 30 sounds represented; 23 consonants and 7 vowels. 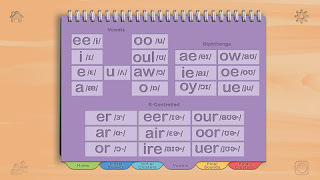 Speech Trainer 3D demonstrates the sounds in two views: Front and Side View and uses the International Phonetics Alphabet. In horizontal orientation, the camera goes on to show you your own face to help you practice (acts like a mirror). Meant to help people practice their pronunciation skills (aimed at children). Contains over 1000 images and all sounds of English. Audio recordings for every word. Built in voice recording allows the person to compare their productions with the audio recording. A variety of artistic faces that react to noise, with bigger reactions the louder the sound. This simple app encourages voicing (apraxia/aphasia) and loud voicing (dysarthria). 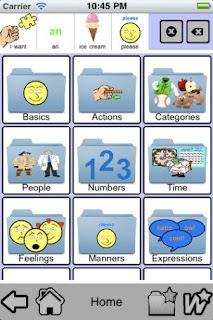 Shows how to produce speech sounds and words. Contains 530 videos, sound clips, and color photos designed to help adults and children to produce the consonant speech sounds in isolation, in words, and in sentences. iTunes also has a free Lite version that contains only words that begin with the letter W.
Is a set of hand exercises (not games) that improves fine motor skills and handwriting readiness. 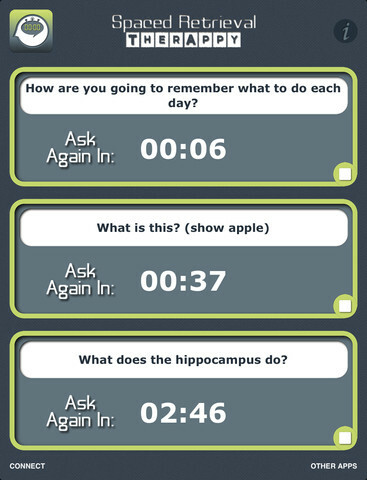 An app to improve memory of names, facts, and routines for all people, including those with memory impairments. Targets auditory and reading comprehension of single words. 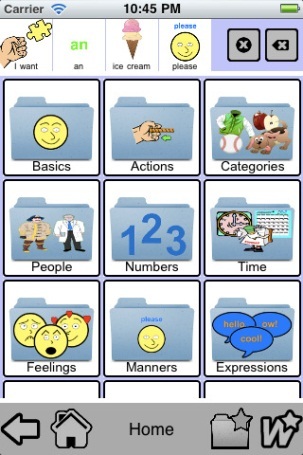 Designed to help people with receptive aphasia and alexia. It can also be a tool to treat attention and other cognitive deficits. 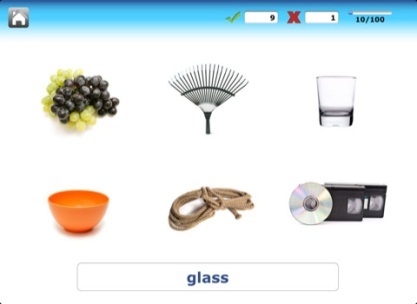 Stroke and brain injured patients can practice word-finding on their own or with a therapist. Full-color photos with real recorded voice for over 500 nouns. App is self-scoring. An app to practice spelling single words and to practice write to dictation. 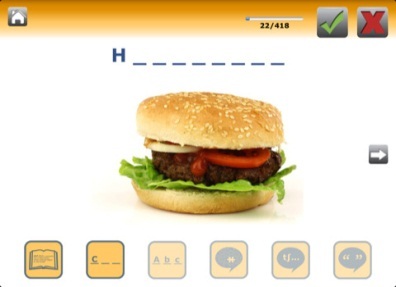 With 4 modes and 3 levels of difficulty in each, users have access to 12 different exercises to practice spelling over 500 words. 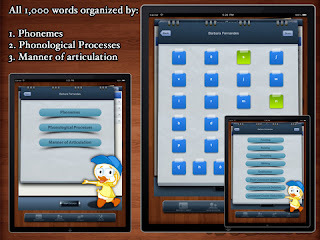 A trial of Language TherAppy, a 4-in-1 app combining Comprehension, Naming, Writing, and Reading TherAppy. Each Lite app contains reduced functionality with a limited set of words (5-7) instead of the 500-700+ included in the full versions. 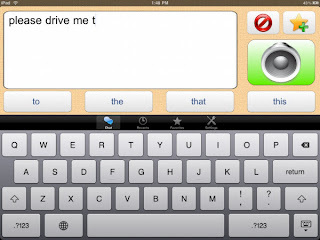 Add one of your own words to Writing & Naming TherAppy instead of unlimited custom words in the full apps. Have access to nearly every single-syllable word in the English language, suitable for all ages. Pick which sounds you want to appear in initial, medial, & final positions and then flip between sounds or words to create the targets you want. Then hear the sounds and words, or record yourself & play it back instantly. Designed for individuals exhibiting abnormal prosody. Prosody refers to the musical aspects of speech, including rate, rhythm, volume, phrasing, and intonation. RRSC Blog Note: The following article was originally published in the June 2014 StrokeNet NewsLetter. I have modified some wording slightly to fit the audience of this blog. I urge you to visit their site as it contains many excellent articles pertaining to strokes and personal experiences of stroke survivors and caregivers. Summer is an important time to remember to provide encouragement to others in the stroke family. ...Schools are closing, grills are firing up, nature is in full bloom, and it is great to be outdoors. All part of what lets us know the season is summer. Do you know what is not seasonal? Exactly!! A stroke! If you have been part of our community for a while you know summer can tend to slow down a great deal in terms of activity on this site in general. We understand everyone has been cooped up this very long, snowy, miserable winter and wants to get out and away from a computer screen, but keep in mind those who are new to us need help now not in the fall. Maybe if we all make the effort to check in and see if someone needs someone else who gets it, we can keep the ball rolling and have hope continue to flourish throughout the summer. More important than anything you could give just a little bit of your time. Setting aside just a few minutes a day to offer a hand of comfort and support throughout the summer will do a world of good to let our stroke friends know how important their recovery really is to us. Experienced Stroke Survivor or Newbie, take every opportunity to get out and enjoy your life. With summer approaching, we would like to remind you that spending time out in the sun and heat should be done with some precaution. Sunscreen should always be used even if you are not prone to burning easily. Stroke often causes diminished neurosensitivity and you may not feel you are burning until you have gotten a considerable burn. Dealing with it later will not at all be pleasant. An ounce of prevention is well worth it. Similarly, certain medications advise against sun exposure. It would be wise to check your medications to be sure they are sun friendly. If not, this does not mean you should not take them to venture out. Never skip your medication. What it does mean is you need to accommodate the medication. You can still have a good time and go out. You just need to do a little planning. Sunscreen will do nothing to counter the sun’s effect in this case. What you need to do is be sure there will be a place where you can be out of the sun. You may want to scope out where you are going in advance to be sure there is a shaded area; you might need to bring an umbrella. One of the most common questions we hear from survivors is why they can’t seem to warm up. Having the chills or an inappropriate read on the ambient temperature is extremely common and why you must stay hydrated. Without an accurate read on whether or not you are too warm you can easily over heat. It takes a very short time to develop heat stroke. The signs of it are nausea, headache, and dizziness, if you feel any of these physical conditions move into a cool air-conditioned area as quickly as possible. Drink plenty of water. Do not drink alcohol as it will raise your body temperature. NEVER mix alcohol with your medicine! Mixing alcohol with certain medications can cause nausea and vomiting, headaches, drowsiness, fainting, or loss of coordination. It also can put you at risk for internal bleeding, heart problems, and difficulties in breathing. In addition to these dangers, alcohol can make a medication less effective or even useless, or it may make the medication harmful or toxic to your body. Most importantly never use your stroke as an excuse to not get out and enjoy your life. Don’t turn down an invitation. We know everyone will appreciate and enjoy seeing you there more than you realize, isn’t that why you were invited? Until next month get out enjoy the weather, make some time for us, and please stay safe! Susan Wahlmann had her stroke at age 39 in November 2011 as a result of her birth control medication. Luckily her husband Michael knew the signs of a stroke ( his grandfather had one years ago) and within 15 minutes, she was in the emergency room of Unity Point West in Rock Island, IL. She received tPA and four and a half months later, after outpatient therapy, was back at work. Other than forgetting words when she is excited or really tired, she has no lingering effects from her stroke. She is now in between jobs, having worked as the Performing Arts Director at Quad City Arts for nearly 20 years. She is a volunteer for Feel Better Friends, a non-profit organization where she volunteers crochet custom dolls for children with cancer and other serious illnesses. She is a volunteer for the Normaleah Ovarian Cancer Foundation and a committee member for the girlpARTS FEST this July. She is a board member for WQPT public television. 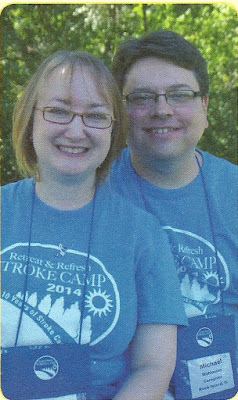 She and Michael have attended Stroke Camp for the past three years, and Susan has created a scrapbook for each year. They hope to attend family camp this year with their 13-year-old daughter, Emma.